Dubbed “Puerto Rico’s best-read man” by the New York Times, Bolívar Pagán was highly educated and a prolific writer.1 Pagán married a daughter of his mentor, labor leader and political giant Santiago Iglesias, and upon the older man’s sudden death, filled his seat as Puerto Rico’s Resident Commissioner in the U.S. House of Representatives. Pagán pursued his father-in-law’s economic initiatives in Congress, particularly the defense of the island’s sugar industry against strict quotas. 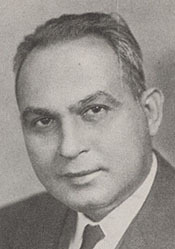 However, Puerto Rico’s strategic location during the Second World War and the appointment of a controversial governor eventually consumed Pagán’s congressional career. 1“Appoints Bolivar Pagan,” 27 December 1939, New York Times: 9. 2Libertad I. Moore to Ansel Wold, 16 January 1940, textual files of the Biographical Directory of the United States Congress, Office of the Historian, U.S. House of Representatives (hereinafter referred to as textual files of the Biographical Directory of the United States Congress). A newspaper article indicates that Santiago Iglesias raised Pagán alongside his 11 children after Pagán was orphaned at a young age, but even in his eulogy of Iglesias on the House Floor, Pagán never confirmed this. “Appoints Bolivar Pagan,” 27 December 1939, New York Times: 9; “Memorial Services Held in the House of Representatives of the United States, Together with Remarks Presented in Eulogy of Santiago Iglesias, Late a Resident Commissioner from Puerto Rico,” (Washington, D.C.: Government Printing Office, 1941): 33. 3See, for example, “Offers Puerto Rico Plan,” 6 June 1939, New York Times: 5; “Resident Commissioner of Puerto Rico Named,” 27 December 1939, Baltimore Sun: 9. 4Moore to Wold, textual files of the Biographical Directory of the United States Congress. 5“Daughter of Island Envoy Wed Here,” 28 September 1933, Washington Post: 8. It is not known whether the couple had any children. 6Second Jones Act of 1917, PL 64-368, 39 Stat. 964. 8Congressional Record, House, 76th Cong., 3rd sess. (3 January 1940): 6. In what appears to be a formality under the provisions of the Jones Act (39 Stat. 964), the Puerto Rican senate confirmed Pagán’s appointment on February 17. See “Pagan Confirmed by Puerto Ricans,” 18 February 1940, Washington Post: 15. Several other Resident Commissioners were appointed to the House. Appointments from Puerto Rico to fill vacancies are permitted under the Jones Act of 1917 (39 Stat. 964). Other Resident Commissioners who were appointed are José Pesquera of Puerto Rico (1932), Quintin Paredes of the Philippines (1935), Joaquin Elizalde of the Philippines (1938), Carlos Romulo of the Philippines (1944), Antonio Fernós-Isern of Puerto Rico (1946), and Antonio Colorado of Puerto Rico (1992). See Biographical Directory of the U.S. Congress, http://bioguide.congress.gov. 9James L. Dietz, Economic History of Puerto Rico: Institutional Change and Capitalist Development (Princeton: Princeton University Press, 1986): 171–172, see especially Table 3.8. 10“Pagan, 61, Is Dead of Cancer,” San Juan Star, 10 February 1961, available in the textual files of the Biographical Directory of the United States Congress. 11H.R. 9360 and H.R. 9361; “Pleads for Puerto Rico,” 13 April 1940, New York Times: 6; Congressional Record, House, 76th Cong., 3rd sess. (12 April 1940): 4464. 12“Puerto Ricans Protest Leahy Rule, Is Report,” 22 May 1940, Baltimore Sun: 4. 13César J. Ayala and Rafael Bernabe, Puerto Rico in the American Century: A History since 1898 (Chapel Hill: University of North Carolina Press, 2007): 136–137, 142; “New Party Is Strong in Puerto Rico Vote,” 7 November 1940, New York Times: 6; “Results in Closely Contested Races for Seats in the House,” 7 November 1940, Washington Post: 6. 14William D. Leahy to Harold Ickes, 16 November 1940, Doc. 9-9-82-Politics-Elections-1940; Classified Files, 1907–1951; Office of Territories, Record Group 126; National Archives at College Park, College Park, MD (hereinafter referred to as RG 126; NACP). 15William D. Leahy to Harold Ickes, 31 July 1940, Doc. 9-8-82-Politics-Elections-1940, RG 126, NACP. 16“Puerto Rico Vote Split,” 9 November 1940, New York Times: 8. 17“Puerto Rico Vote Split”; William D. Leahy to Harold Ickes, 6 November 1940, Doc. 9-9-82-Politics-Elections-1940; RG 126; NACP. 18Fernando Bayron Toro, Elecciones y partidos políticos de Puerto Rico, 1809–2000 (Mayagüez: Editorial Isla, 2003): 191–194; “Puerto Rico Vote Split”; “Total Number of Votes Cast in the Last Election by Each Political Party for Commissioner to Washington,” Doc. 9-8-82-Politics-Elections-1940; RG 126; NACP. 19David T. Canon et al., Committees in the U.S. Congress, 1789 to 1946, vol. 3 (Washington, D.C.: CQ Press, 2002): 797. 20Congressional Record, House, 77th Cong., 1st sess. (1 December 1941): 9297. 21“Mainland Sugar Wins House Help,” 2 December 1941, New York Times: 19. 22Senate Committee on Finance, Extension of Sugar Act of 1937, 77th Cong., 1st sess., S. Rep. 907; P.L. 77-386, 55 Stat. 872–873. 23Associated Press, “Controlled Nazi Press Blames ‘Jewish Suggesters’ to F.D.R.,” 29 May 1941, Atlanta Constitution: 6. 24Canon et al., Committees in the U.S. Congress, 1789 to 1946, vol. 3: 797; “Puerto Rico Base Work Progressing, Leahy Reports,” 2 January 1940, Washington Post: 4. 25John Lear, “Rexford Tugwell under Fire as Governor of Puerto Rico,” 1 March 1942, Washington Post: B3; Lear, “Tugwell Stirs Up a Tropical Storm,” 8 March 1942, Baltimore Sun: SC10. 26“Assails Naming Tugwell,” 30 July 1941, New York Times: 5. 27Surendra Bhana, The United States and the Development of the Puerto Rican Status Question, 1936–1968 (Lawrence: The University Press of Kansas, 1975): 41, 46–47. 28Hearing before the Senate Committee on Territories and Insular Affairs, Nomination of Rexford G. Tugwell, U.S. Senate, 77th Cong., 1st sess. (6, 12, 13, and 18 August 1941). 29“Brand Tugwell a Quisling; Call for His Ouster,” 22 January 1942, Chicago Daily Tribune: 7; “Tugwell Called American Quisling,” 22 January 1942, Baltimore Sun: 13; “Tugwell Removal Asked by Puerto Rico Official,” 3 February 1942, Atlanta Constitution: 12. 30“Tugwell Worse Governor, Says Plea for Recall,” 29 October 1942, Chicago Daily Tribune: 9; “Tugwell’s Recall Urged,” 29 October 1942, New York Times: 25; “Tugwell under New Attack on Ouster of Aid,” 12 November 1942, Chicago Daily Tribune: 13; John Lear, “Rexford Tugwell under Fire as Governor of Puerto Rico,” 1 March 1942, Washington Post: B3; Lear, “Tugwell Stirs Up a Tropical Storm,” 8 March 1942, Baltimore Sun: SC10. 32“Claims Tugwell Tries Nazi Ideas in Puerto Rico.” 17 October 1942, Chicago Tribune: 14. 33Eugene Rachlis, “Puerto Rican Opposes Plan for Food Fund,” 21 June 1942, Washington Post: 9. 34John Fisher, “Millions Voted Puerto Rico if Tugwell Quits,” 18 November 1942, Chicago Daily Tribune: 1; “Moves in Congress to Oust Tugwell,” 18 November 1942, New York Times: 16. The latter claims “Representative Page” introduced the amendment, but there was no one named “Page” on the House Agriculture Committee in the 77th Congress. However, Representative William Poage of Texas served on the committee. See Congressional Directory, 77th Cong., 2nd sess. (Washington, D.C.: Government Printing Office, 1941): 197. 36“Moves in Congress to Oust Tugwell,” 18 November 1942, New York Times: 16; John Fisher, “Millions Voted Puerto Rico If Tugwell Quits,” 18 November 1942, Chicago Daily Tribune: 1. 37“Pagan Disputes Ickes,” 20 November 1942, New York Times: 11. 38William Moore, “Tugwell Debate with Ickes Fags a Puerto Rican,” 25 February 1943, Chicago Daily Tribune: 11. 39James B. Reston, “Right of Electing Governor Planned for Puerto Ricans,” 4 July 1942, New York Times: 1; “Election of Governor Planned for Puerto Rico,” 5 February 1943, Atlanta Constitution: 3; “Plans Being Made to Let Puerto Rico Elect Its Governor,” 5 February 1943, Baltimore Sun: 11. 40“Offers Bill to Aid Puerto Rico in ’42,” 7 July 1942, New York Times: 10. Pagán frequently found himself trading barbs with Marcantonio. See, for example, Congressional Record, House, 76th Cong., 3rd sess. (26 April 1940): 5148–5155. 41Franklin D. Roosevelt, “Message to Congress on Local Election of a Governor of Puerto Rico,” in John T. Woolley and Gerhard Peters, The American Presidency Project, http://www.presidency.ucsb.edu/ws/?pid=16371 (accessed 28 September 2010); “Home Rule Asked for Puerto Rico,” 10 March 1943, New York Times: 3. 42“Puerto Rican Rule to Come Up Tomorrow,” 18 July 1943, Chicago Daily Tribune: 16; “Ickes, Seven Others Seek Workable Formula for Puerto Rican Home Rule,” 18 July 1943, Washington Post: M8; “Back Puerto Rico Bill,” 6 August 1944, New York Times: 16. 43“Puerto Ricans Held on Verge of Revolt,” 1 May 1944, Christian Science Monitor: 11; “Tugwell Rule Brews Revolt, Asserts Critic,” 2 May 1944, Chicago Daily Tribune: 8; “Puerto Rico Revolt Hinted; Tugwell Ouster Demanded,” 2 May 1944, Los Angeles Times: 2; “Assails Tugwell as ‘Like Hitler’,” 2 May 1944, New York Times: 9; “Puerto Rico Revolt Said Seething,” 2 May 1944, Atlanta Constitution: 3. 44Bolivar Pagán to Franklin D. Roosevelt, 6 June 1944, Doc. 9-8-82-Politics-General, RG 126, NACP. 45“Tugwell Denies His Regime Is Dictatorship,” 4 May 1944, Chicago Daily Tribune: 5. 46“Puerto Rico Safe, Tugwell Declares,” 4 May 1944, New York Times: 5. 47Franklin D. Roosevelt to Bolivar Pagán, 9 October 1944, Doc. 9-8-82-Politics-Elections-General, RG 126, NACP. 48Bayron Toro, Elecciones y partidos políticos de Puerto Rico: 202. 49“Tugwell in Puerto Rico,” 19 March 1944, Washington Post: B5. 50Elmer Ellsworth and J. T. Piñero to Bolivar Pagán, 4 May 1944, Doc. 9-8-82–Politics-Elections-Legislation, U.S., RG 126, NACP. Some results separate the remaining Partido Liberal votes from the Coalición votes. Taken separately, the Partido Liberal won 38,630 votes, the Socialistas won 68,107, and the Unión Republicanas won 101,779 votes. “Total Number of Votes Cast in Last Election by Each Political Party for Commissioner in Washington,” Doc. 9-8-82-Politics-Elections-1944, RG 126; Congressional Record, Extension of Remarks, 79th Cong., 1st sess. 22 January 1945; 9-8-82-Politics-Elections-1940; RG 126; NACP. 51Paul W. Ward, “New Measure on Puerto Rico,” 21 December 1944, Baltimore Sun: 7. 52Pagán won his final senate term as a Socialista in 1948. See Bayron Toro, Elecciones y partidos políticos de Puerto Rico, 1809–2000: 212. 53“Puerto Rican Ex-Official,” 10 February 1961, Washington Post: B4; “Bolivar Pagan, 61, Puerto Rican Aide,” 10 February 1961, New York Times: 24. According to Social Security records, Pagán was born in 1897, which would have made him 64 when he died. However, his obituaries state that he died at age 61. "Bolívar Pagán" in Hispanic Americans in Congress, 1822-2012. Prepared under the direction of the Committee on House Administration by the Office of the Historian and the Office of the Clerk, U.S. House of Representatives. Washington: Government Printing Office, 2013. Pagán, Bolívar. América y otras páginas. San Juan, P. R.: [s. n.], 1922. ___. El sufragio femenino (estudio jurídico). San Juan, P. R., 1924. ___. Ley municipal, revisada, anotada, y comentada. San Juan, P. R.: La Correspondencia de Pto, Rico, Inc., 1925. ___. Ideales en marcha; discursos y artículos. San Juan, P. R.: Biblioteca de autores puertorriqueños, 1939. ___. Puerto Rico: The Next State. Washington, D. C., 1942. ___. Discurso de Bolivar Pagán. San Juan, P. R.: [Imprenta Venezuela, E. Franklin & Co.], 1943. ___. Crónicas de Wáshington. San Juan, P.R. : Biblioteca de Autores Puertorriqueños, 1949. ___. Constitución para Puerto Rico. [San Juan, P. R.], 1951. ___. Historia de los partidos políticos puertorriqueños, 1898-1956. San Juan, P. R.: Librería Campos, 1959. ___. Lecciones de gobierno civil. San Juan, P. R.: Departamento de Instrucción Pública, 1961. ___. Proccerato puertorriqueño del siglo XIX: historia de los partidos políticos puertorriqueños, desde sus orígines hasta 1898. San Juan de Puerto Rico: Editorial Campos, 1961.